Voted One of the Best … Thanks! 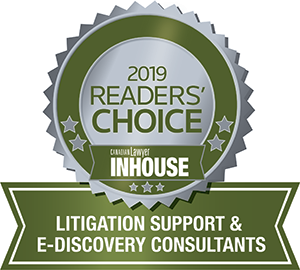 We are honoured to have been awarded the 2019 Canadian Lawyer InHouse Readers’ Choice Award for Litigation Support & E-Discovery Consultants. For the third consecutive year Canadian Lawyer InHouse has run their Readers’ Choice Awards which are designed to allow readers to recognize the vendors and suppliers they feel are the best at what they do. Heuristica also won the Canadian Lawyer Readers’ Choice Award for Legal Process Outsourcing and Document Review in October 2018. For more information about the awards and a complete list of winners please visit their web site.